Finally the unofficial start to summer is upon us! 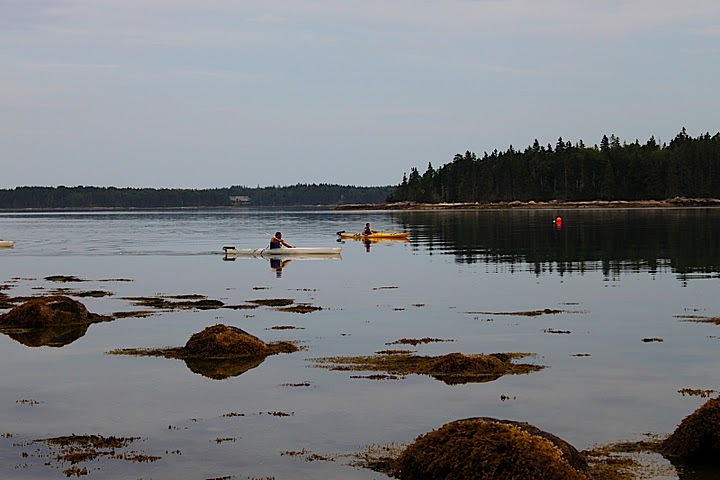 This weekend obviously holds a lot of meaning: it’s the start of three full months of relaxation, sunshine and leisure after a lengthy winter and two months of rain. Bring it on. So the recipe that I post pre-Memorial Day weekend must have the same qualities as the actual weekend, of course. But why is it that I forget to take pictures of recipes I try when I’m in full-on summer-fun mode? Can’t blame me, I suppose. I did make cannolis last week, which were delicious. Incredible, even. 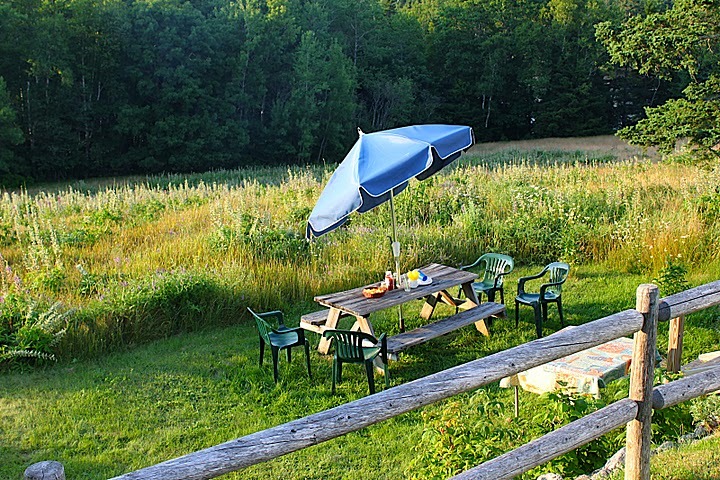 But far too labor intensive for the picnics and barbecues that will be occurring this weekend. (But not too labor intensive for the weekend after Memorial Day, so stay tuned). 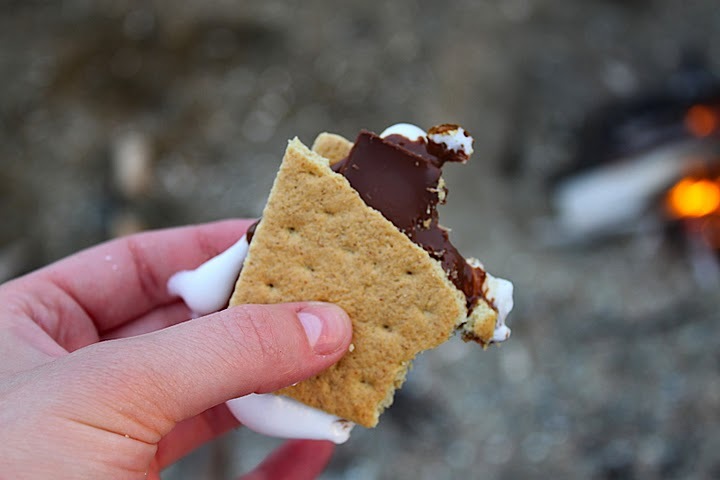 So, instead, I put a spin on the cannolis and created cannoli smores with homemade graham crackers! Yes, that’s a thing. Think about how brilliant this is: homemade cinnamony graham crackers that are crunchier and more delightful than the store-bought version and represent summer in so many ways, but then are sandwiched with sweet sweet ricotta! You know how crazy I am about the ricotta. Delicious, incredible, and more importantly, relaxed and leisurely. 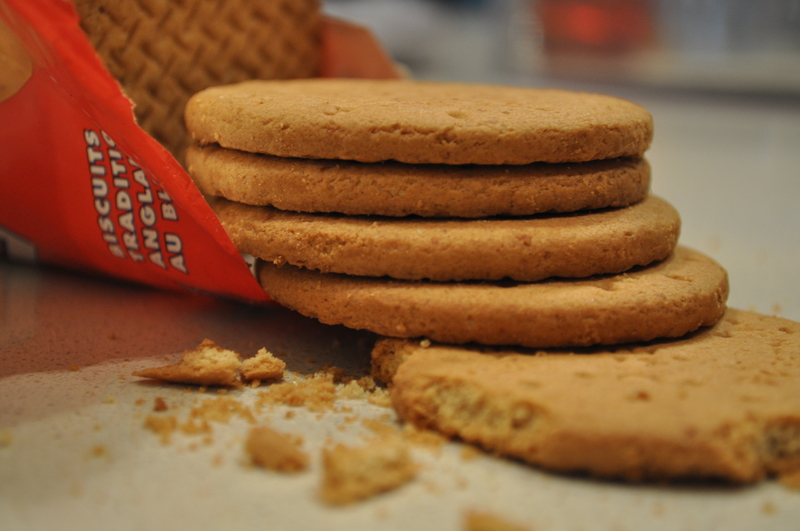 They might even be filled with sunshine! They’re that good. Happy summer to you! I’m giving a shortcut with the cannoli cream in this recipe (unlike the actual homemade cannoli recipe that will appear next week). But obviously, in a pinch, when, I don’t know, a cocktail is waiting for you on the porch in the 80 degree weather overlooking the beach, you can buy store-bought graham crackers too. I wouldn’t judge. Not this weekend, anyway. In a food processor, or blender, combine the flour, brown sugar, baking soda, and salt. Mix on low to combine. Add the butter and mix on low until the mixture is the consistency of a coarse meal. In a small bowl, mix together the honey, milk, and vanilla extract. Add to the flour mixture and mix on low until the dough comes together. It will be soft and sticky. Prepare the topping: In a small bowl, combine the sugar and cinnamon, and set aside. Divide the dough in half and return one half to the refrigerator. Sprinkle an even layer of flour onto a clean counter and roll the dough into a long rectangle about 1/8 inch thick. Trim the edges of the rectangle to 4 inches wide. Cut into squares of desired size. Gather the scraps together and re roll and repeat steps. Place the crackers on one or two parchment-lined baking sheets and sprinkle with the topping. Chill until firm, about 30 to 45 minutes. Repeat with the second batch of dough. Let cool on a baking rack. In an electric mixer, blend together all ingredients except chocolate chips. Fold in chocolate chips and refrigerate. 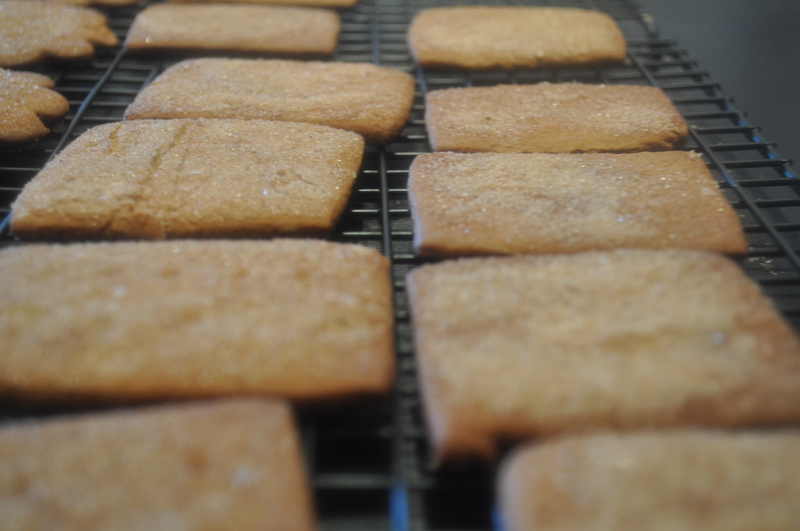 To assemble: Spread 1-2 tablespoons of ricotta cream to one graham cracker. Sandwich with second graham cracker and dust with powdered sugar. I’m not the biggest fan of zucchini. It’s so overused in the vegetarian options at restaurants. It always a let-down, whether it’s steamed, sauteed, fried, an entree, or a side dish (and it’s been cooked as all of them in the past). It’s disappointing, not exciting, never seasoned well, and frankly, quite boring. So the surplus of the zucchini and summer squash in the recently reopened farmers markets does not entice me. But what does entice me?? 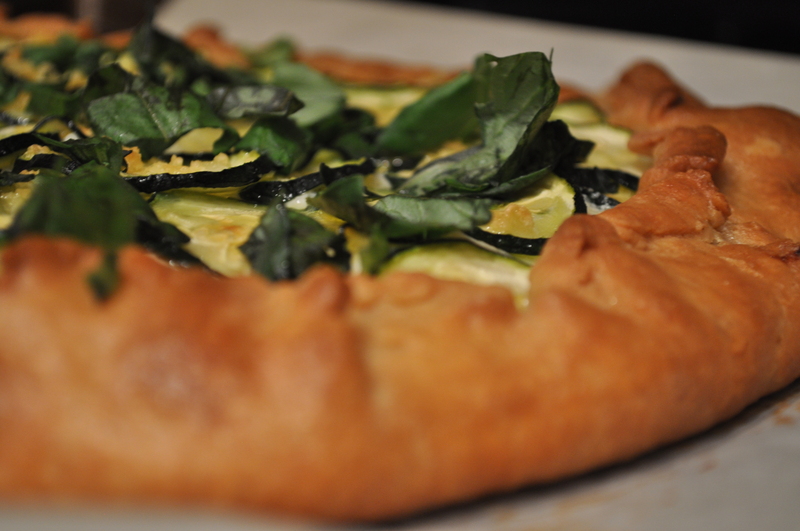 This recipe for a ricotta zucchini tart! 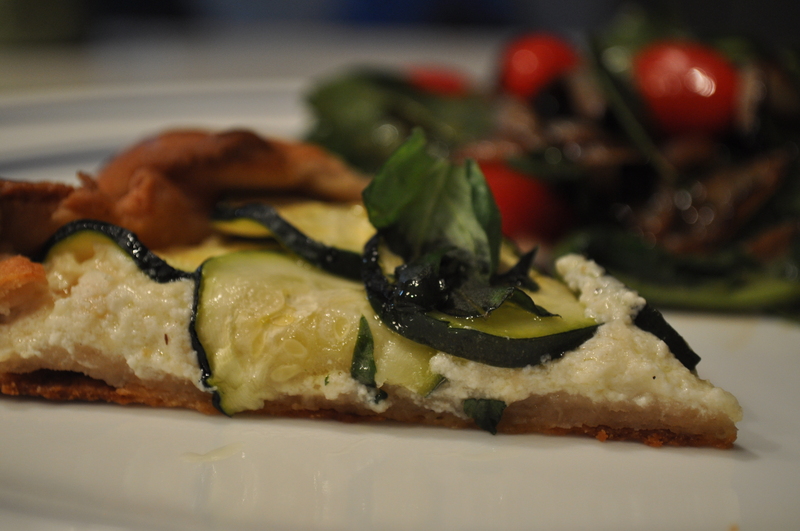 Not so much the zucchini part, obviously, but definitely the ricotta. And the mozzarella, and the parmesan and the garlic oil. Mmm. I’m happy to report that due in part to my laziness in not wanting to be creative, and in part to my grocery store not having nice looking eggplants, I begrudgingly used zucchini and loved it. It’s the simplicity (or, blandness, let’s not kid ourselves) of the zucchini that I despise so much that works beautifully with all of the other components. No, really. I’m sure that other vegetables would work, but it’s the balance of the cheese to the vegetables that is key here. Delish. 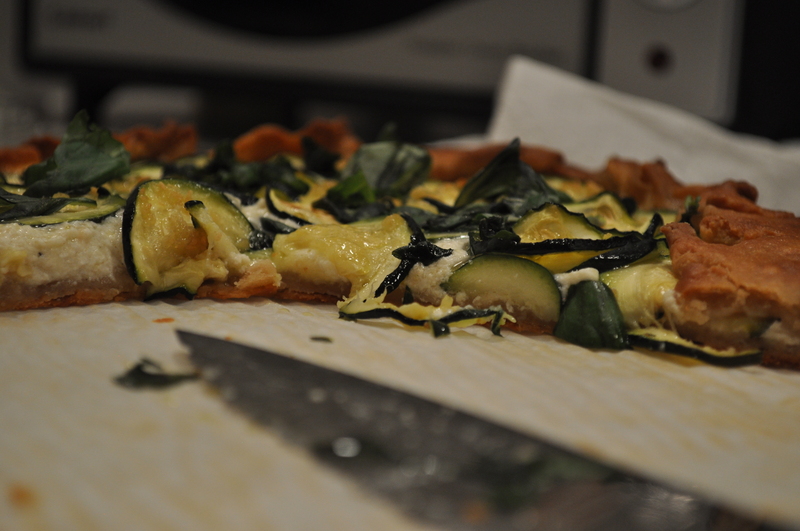 Zucchini and summer squash, I’m coming back for you. For this tart only. Mix all of the ingredients together. Roll into a ball and wrap in plastic wrap. Flatten out to form a disc. Place in the refrigerator for at least one hour. Spread the zucchini on a double layer of paper towels. Sprinkle with salt. 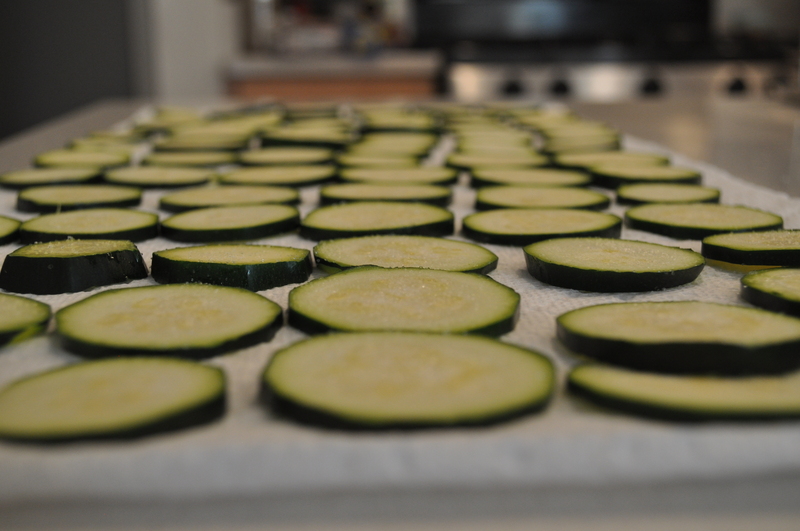 Let it sit for 30 minutes, and then gently blot the zucchini dry. While waiting for the zucchini, mix together the minced garlic with the olive oil and set aside. Mix together ricotta, mozzarella and parmesan cheeses. Add a teaspoon of the garlic oil and set aside. Preheat oven to 400 degrees. Line baking sheet with parchment paper. Roll out the refrigerated dough to a 12 inch round. Place onto the baking sheet. Spread the cheese/garlic mixture onto the dough, leaving a two inch border. Lay the zucchini on the ricotta filling. Drizzle the remaining garlic oil on top of the zucchini. Fold over the border over the filling, pleating and pressing to make it secure. Bake for 35-40 minutes, until the crust is nicely browned and the filling is bubbly. Take it out of the oven and sprinkle basil leaves on top. Let the tart sit for 5 minutes and then slice. There are about 18 different types of cheesecakes in the world. Not flavors, but actual types of cheesecakes and how they are made. Yes, 18. That’s what wikipedia is telling me, anyway. Mostly they differentiate by region – by the flavor of compote that is put on top of the cheesecake. Or they are refrigerated, rather than baked. But while I happened to be on the wiki page for cheesecake, the Japanese description caught my eye: “smooth flan-like texture and almost plasticine appearance.” What an amazingly delicious sounding and totally weird cheesecake! I started looking up recipes. Japanese cheesecakes does use cream cheese. And like most American cheesecakes, it is baked, not refrigerated. And it uses a lot of eggs. But boy, that is where the similarities of the two versions end. The Japanese version is light and fluffy and almost has a steamed texture to it. It’s quite delightful, actually, but it lacks the traditional cheesecake quality of tasting like, well, cheese. In fact, my mom, a lover of all things cheese and all things cake, especially when they are put together, said that this was even more delicious when you don’t call it a cheesecake. Awesome (and so truthful!). Do not let any of this deter you from making this, though! In fact, let it be encouragement to make it as soon as possible! It’s quite lovely in its own right. 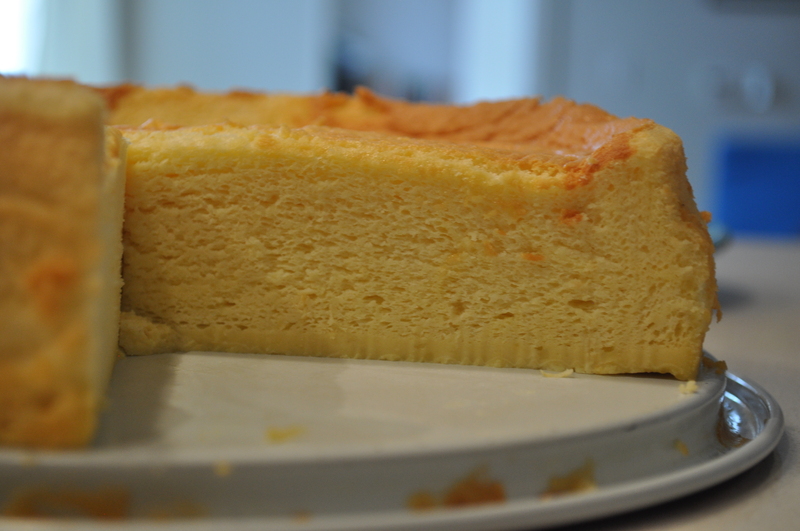 It’s creamier than a chiffon cake, but still has the airiness quality of one. And hello, wiki said it’s “flan-like,” which completely sold me. And wiki is always right. 1. Preheat oven to 320 degrees. Grease a 9 inch round springform pan. Line the outside with aluminum foil. 2. Over a double boiler, melt together butter, cream cheese and milk until completely smooth. Set aside to cool. 3. In a clean bowl, beat egg whites until foamy. Add cream of tartar and continue to beat on medium speed. As you see soft peaks forming, slowly pour in the sugar until the egg whites are light and fluffy and hold their own shape. 4. To the cooled cream cheese mixture, whisk in egg yolks, vanilla and lemon zest. Fold in all of the dry ingredients until they are completely incorporated into the cream cheese mixture. 5. 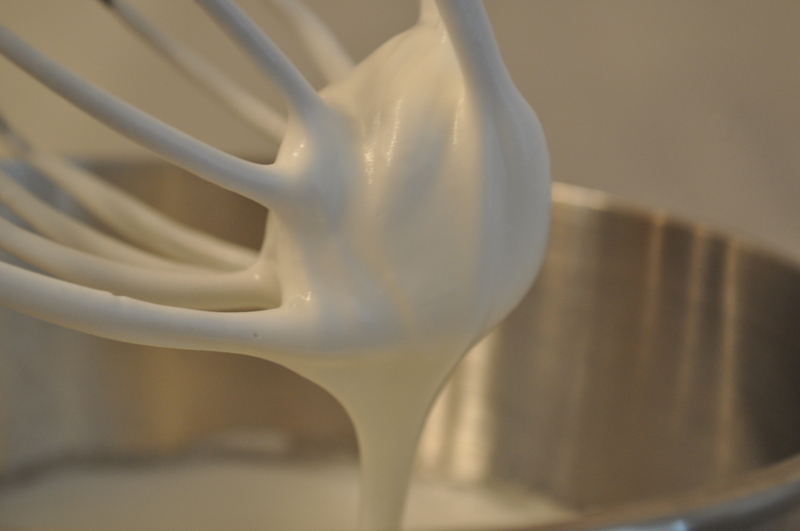 Working in batches, fold in the egg whites to the cream cheese mixture, being careful not to deflate the egg whites. When all of the egg whites are incorporated, pour into the prepared pan. 6. Fill a separate 9×13 baking pan halfway with water. Place the cheesecake in the center rack of the oven. Place the 9×13 pan on the rack below, to create a water bath. 7. 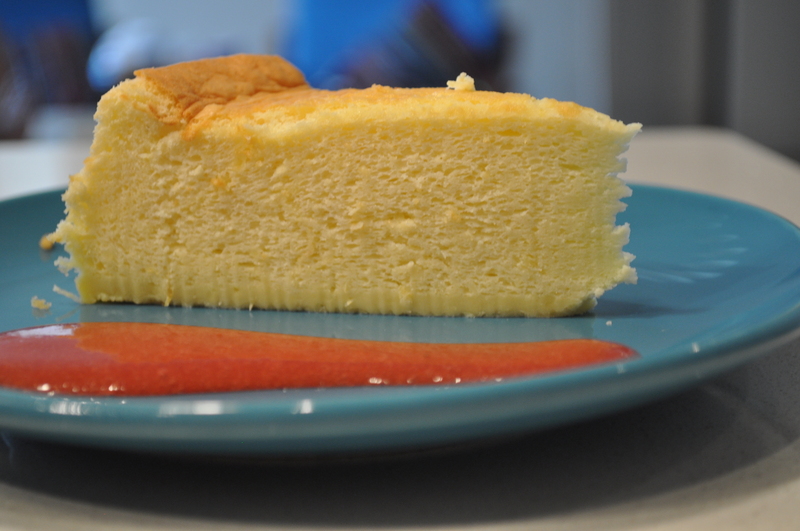 Bake cheesecake for 70 minutes, until a toothpick tester comes out clean. Let cool completely. 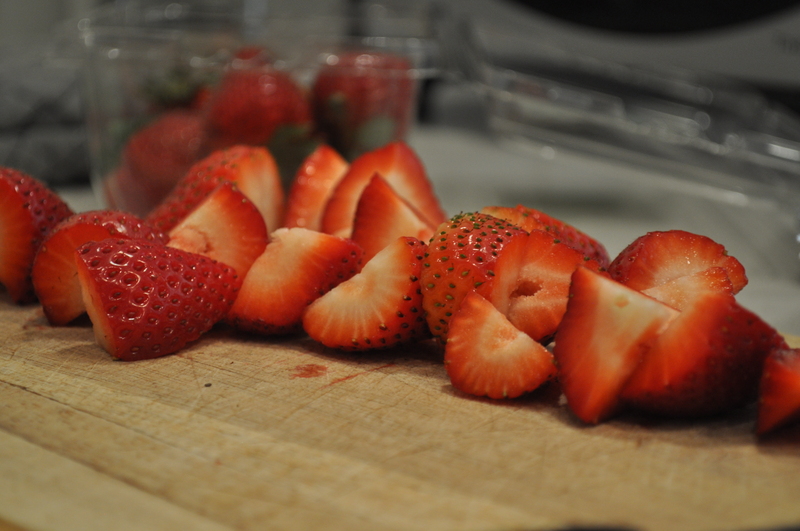 Serve at room temperature or cold with strawberry sauce. 1. Blend everything together until smooth. Strain to take out seeds. Serve cold or room temperature with cheesecake. Did you hear about the wedding last week?? It was pretty big, you might have seen. Did you see the dress? Did you see the kiss? Did you hear about the cake?! I do have a mild obsession with the British monarchy, it’s true. But this is neither the time nor the place to discuss this. 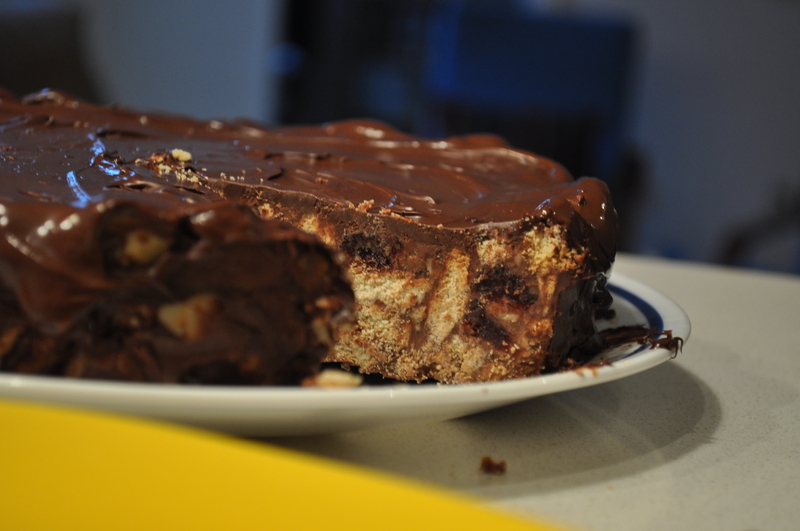 This, my friends, is about another obsession of mine: no bake desserts (especially those involving biscuits). It may be a pretty specific category, but they’re pretty awesome – creating a full-fledged delicious dessert, using nothing but a couple ingredients and never turning on the oven! So easy, so simple, so delicious. They are a wonder to me. 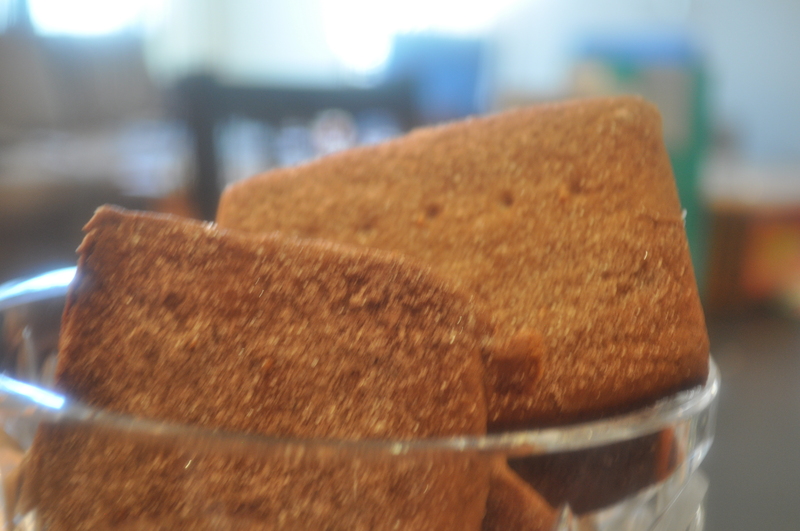 Which is why I was surprised to learn that the groom’s cake at the Royal Wedding was a chocolate biscuit cake – a no bake “cake” using simply British tea biscuits, chocolate and condensed milk. Amazing. And that was all that was needed to serve such a regal crowd! You know you have to try this one. So it turns out that you don’t need to crash a royal wedding in order to eat like the royals! No, no. You just need a few ingredients and a refrigerator. And a fancy hat. But only if you feel like it. 1. Grease a pie plate, 8 inch square dish, or any dish of a similar size. Line with parchment paper and then grease the parchment paper. Set aside. 2. Stir together the crushed biscuits with nuts and dried cherries in a large bowl. Set aside. 3. Over medium heat, in a double boiler, melt together the 5 oz. of dark chocolate, 5 oz. 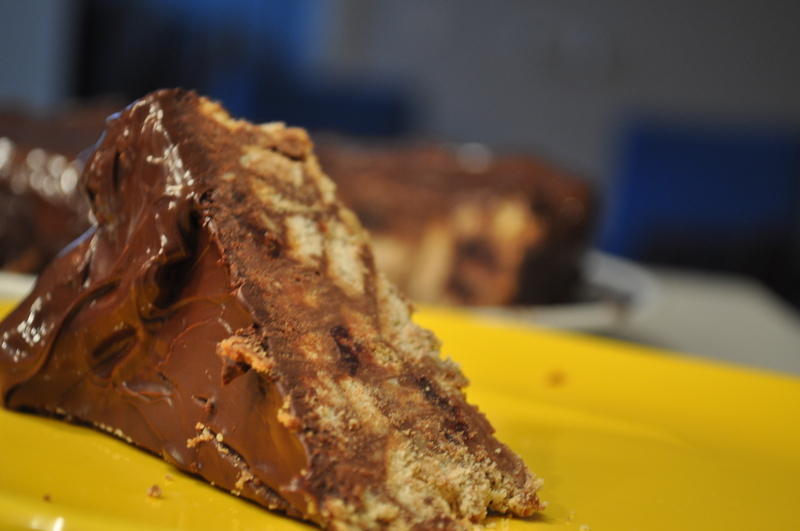 milk chocolate, butter and condensed milk until completely melted and thick. 4. Pour chocolate mixture over the biscuits and stir together until everything is coated. Pour into prepared dish and pat down to ensure that the cake will take the shape of the plate. Refrigerate for 2 hours. 5. 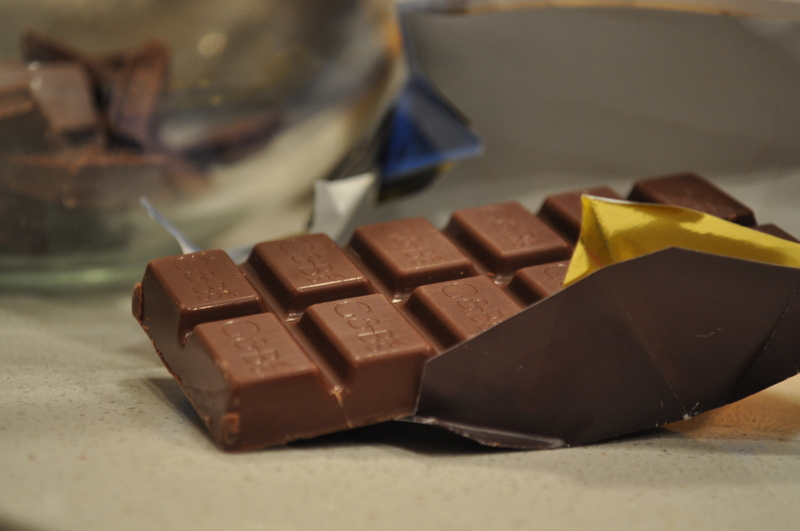 Melt the dark chocolate chips in the microwave in 30 second intervals. Stir after every interval until the chips are melted. 6. Unmold the cake and remove the parchment paper. 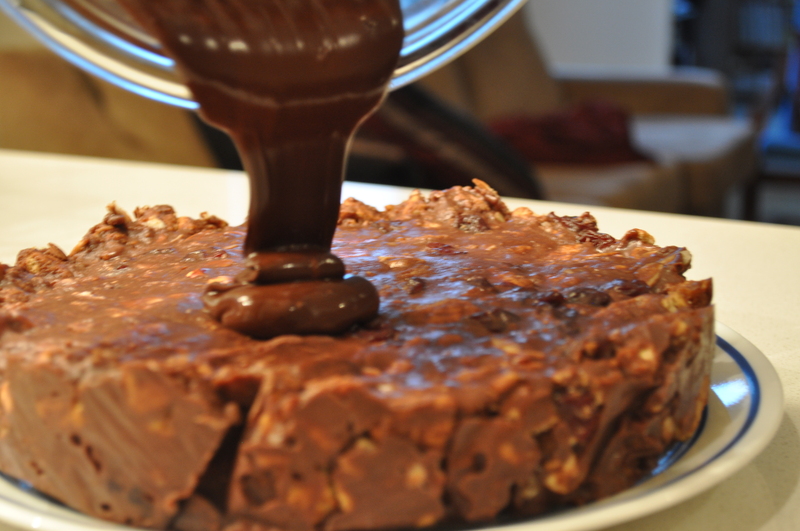 Pour the melted chocolate in the center of the cake and spread so it will run down the sides of the cake. Let the chocolate set for about 15 minutes and then slice.